Also: The Division 2, Divinity: Fallen Heroes, Age of Wonders: Planetfall and more! Vampire: The Masquerade—Bloodlines launched almost 15 years ago, and the long wait for a follow-up is almost over. Resurrected by Paradox Interactive and Hardsuit Labs, Bloodlines 2 returns to the World of Darkness, specifically the Seattle nights, promising undead conspiracies, funky vampire powers and lots necks to bite. You've waited long enough, so give Rick Lane's preview and this month's cover star a read. This year's multitude of impending launches are sure to drain your bank account, but we're here to help you save your cash with our annual list of the top 50 free games. Classic RTS games, vintage Elder Scrolls, brilliant first-person shooters—it should keep you busy. Elsewhere this month, Andy Kelly talks cars and the secrets behind Forza Motorsport's fine-tuned handling with Turn 10. Pip also takes a dip in Abzu, exploring how the chill diving game recreates the dream of scuba. Expect tonnes of gorgeous underwater art. Andy also checks out the next Divinity game and follow-up to Original Sin 2. Good news for fans of Original Sin's combat: it's a tactics game. Lots of RPG stuff has seeped in, too, so don't fret. You'll be able to catch up with the previous game's characters, as well as hang out on your old ship when you're not getting into fights. Previews this month also include Age of Wonders: Planetfall, Afterparty and Barotrauma. On the review front, we've got The Division 2, Anthem, Devil May Cry 5, Baba is You and more. It's been a busy month. 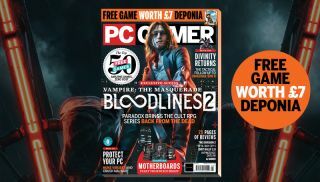 On top of all that, you can also check out our hardware buyer's guide, the third part in Rick Lane's Dishonored 2 diary series and plenty more. This month's free gift is the adventure game Deponia. Paradox and Hardsuit Labs fill us in on Vampire: The Masquerade—Bloodlines 2. The top 50 free games. The secrets behind Forza Motorsport's handling. Our first look at Divinity: Fallen Heroes. Age of Wonders: Planetfall, After Party, Barotrauma and more previewed. The Division 2, Anthem, Devil May Cry 5, Baba is You and more reviewed. Our hardware buyer's guide and monitor group test.